Vintage is my job. We host around 150-200 vendors at each of our 8-10 shows per year, plus all the shoppers buying at the shows…so that’s…math I can’t do. The point is, we see a LOT of vintage décor bought and sold. These are the things I see that are hot right now, but still classic pieces that will last through the trend. Global Chic looks like treasures you found on vacation in some exotic place. Or maybe old Buddha statues with the paint chipping off. Pillows and rugs that look like they came from a market in Marrakesh. Indian kantha quilts thrown over a chair, bone inlay tables and Mexican pottery. These pieces create an interesting and collected look, like you’ve traveled the world and have been curating over the years. 2 – Worn Leather Furniture. 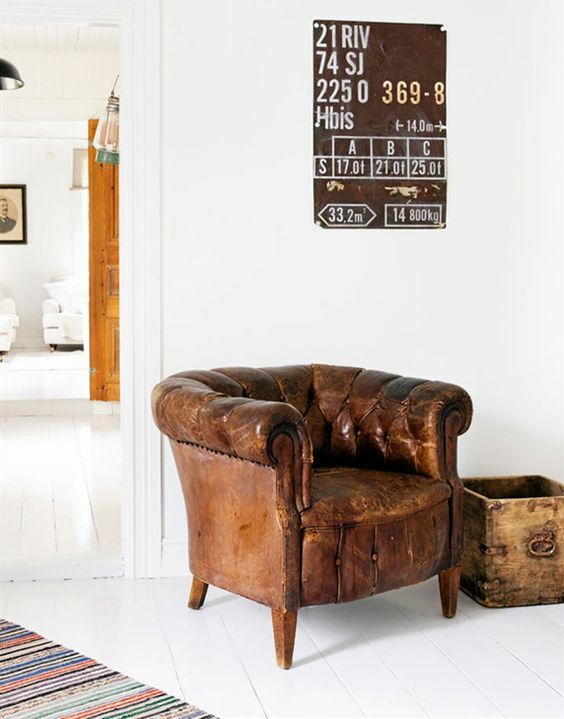 Worn leather club chairs are one of my favorite things! You know the ones in lounge areas in restaurants or shops that are NEVER for sale? Chairs or sofas where the leather has a lived-in look are just cozy and yummy…I’d take a worn piece over a new one any day. It adds history and warmth to your space with a feeling that it may have a story or two. Plus, leather can work with anything else you have going on. 3 – Your Grandma’s Midcentury Furniture. Recently, we cleaned out my aunt’s house and found two perfect midcentury dressers buried under tubs and boxes. You can find similar reproduction pieces at places like West Elm but the real deal is always better! Check estate sales and your favorite grandparent’s house for the originals. The easiest way to add warmth and life (literally!) to your home is through nature. Snip a couple branches off a tree and keep it in a large jar or vase. We have a dried plant from the beach in California on our mantle. Nature-inspired fabrics, botanical prints, brass bugs or animals, flowers, turtle shells, seashells and art are easy ways to bring the outside in. Wicker and rattan. Are. Everywhere! This is a fun way to add a boho or vintage feel to your style. You know those hanging rattan chairs? We had one when I was little. In early 1980 somethin. Headboards, tables, cabinets, chairs, baskets…it all sells QUICK. If you see it, grab it. If it’s not in the best shape, paint it! I’m still kicking myself for not grabbing this Trova print at our last show. 1970’s art prints, Midcentury art, event or festival posters usually have great color and can mix with almost any style. This could be your one really cool piece with that WOW factor and can be found in almost any price range. 7 – Same color pottery. Displaying pottery or dishes all in the same shade will make a huge impact! Look for milkglass, jadeite, or anything in your favorite color and load up. This is an easy but stylish collection that can look like it’s been passed down through generations. Get started at garage sales, thrift stores and estate sales. Chinoiserie is classic and a few Asian style pieces mix well with almost anything. Chippendale style bamboo chairs, a pagoda shaped mirror or headboard, blue and white ginger jars and Foo dogs are always good finds! 9 – Oversized glass jars. 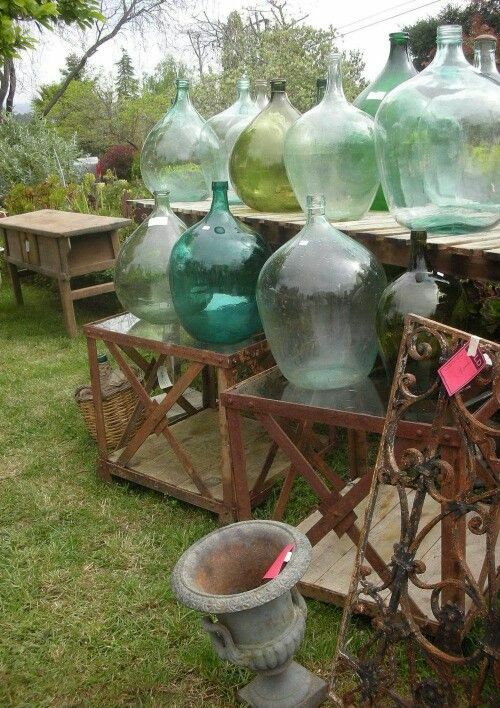 Demijohn bottles are one of those things you would probably keep forever. You can find them in shades of green or clear, and are so simple but beautiful no matter how you use it. We see these at Antiques Week in Round Top, Texas and I have a few smaller reproductions (shhh!) from places like TJ Maxx and World Market. These work with everything from Farmhouse to Modern. This is my weakness. Persian, kilim, tribal, whatever. I love them all and I love when they’re worn through in places, when the edges are frayed and the colors are deep. These rugs definitely tell a story and add colorful layers to your home’s vibe. Use them with any style, layer them, scatter them around the house. Search “estate rug” on eBay for some really great finds! Kristen Grandi is the Owner/Founder at Junk Hippy, one of Country Living and Flea Market Style’s top vintage events. She lives in Oklahoma City with her husband and two girls. Sign up for her newsletter at www.junkhippy.com for décor inspiration and event updates.